Flashpoint is one of the most important stories in DC Comics’ recent history. But bizarrely, it’s also become one most popular Flash stories to crop up in other media. There’s an animated film, it’s been part of the CW TV show, and now, it’s being set up as the story of the Flash movie. Here’s what you need to know. Having spent years moving away from what it dubbed as “Elseworld” stories—tales set outside of the canon of the DC universe in parallel universes—and dealing with nearly three decades of its sprawling comic continuity, in 2011 DC Comics announced Flashpoint. It was a major event series that would introduce readers to a whole new timeline, and by the end of it, tear up the DC multiverse as they knew it. In its place would be an infamous new continuity, populated with brand-new, younger versions of the company’s stable of characters across 52 new ongoing series, a universe that would go on to be known as the New 52. But before all that, we have the story itself, which sees Barry Allen waking up in a world very different than the one he’d been living in for decades, after making the decision to go back into his personal timeline and stop his mother’s death at the hands of the Reverse-Flash. In saving her, Barry created a whole new timeline: one where his mother lived, where his father never went to jail (and instead passed away about three years before the events of Flashpoint), and where he never gained superpowers and became the Flash. That’s hardly biggest change Barry’s decision made, though, but just the tip of a very topsy turvy world. Central City’s finest superhero is Captain Cold. Thomas Wayne becomes Gotham’s dark knight after a criminal murdered his son Bruce, an event that causes his wife Martha to go insane and become the costumed supervillain known as the Joker. The Justice League was never formed, and while Superman is nowhere to be found (eventually revealed as being kept hidden by the US government since he first landed on Earth, locked away in solitary confinement), two of its former members, Wonder Woman and Aquaman, have gone to global war with each other—with the Amazons having just invaded the British Isles and Western Europe being submerged underwater by the Atlantean counteroffensive. Struggling to retain his memories of the real timeline, Barry manages to successfully recreate the accident that gave him his speedforce powers and convince Batman, Cyborg, and eventually Superman to help him find Reverse-Flash—believing him to be responsible, rather than his decision to save his mother—and reset the timeline, before the Amazon/Atlantean war can destroy the Earth. Except, of course, things go terribly wrong. The US is drawn into Wonder Woman and Aquaman’s war, the heroes get the snot kicked out of them, and then Barry learns from Reverse-Flash that he’s the one actually responsible for screwing up time before Thomas Wayne stabs Reverse-Flash to death. And that’s before everyone realizes that the fighting has set off a chain of seismic event that threatens to tear Earth apart. Realizing his reality is doomed, Thomas Wayne implores Barry to go and reset the timeline, making sure that Flashpoint—and Barry’s mom—will die so that a better world, one where his son Bruce lives, will take its place. Carrying a letter from Thomas to the son he never knew, Barry forces his way back into the timestream, merging with the version of himself that was on the way to save his mother and cancelling out the Flashpoint reality. But he doesn’t get back to the timeline he knew before this whole mess started, realizing he can’t see just one timeline, but three: the main DC universe, the universe inhabited by DC’s Vertigo imprint, and a third inhabited by the characters of Wildstorm. Barry is confronted in the timestream by the immortal known as Pandora, and is told that a sinister force—who, six years later, it turns out is actually Doctor Manhattan from the seminal series Watchmen!—has split the timeline in order to weaken it for a future confrontation. She tasks Barry with merging them, but in the process he ultimately ends up creating a whole new timeline, populated by younger versions of his friends and fellow heroes, who remember neither the world Barry came from in the first place nor the events of Flashpoint, laying the groundwork for a huge new chapter in the DC universe. In the years since it first hit shelves, Flashpoint has made a name for itself as one of the most infamous and important events in DC’s recent history—and in the process, made itself a pretty tempting story for other mediums to tackle. With the announcement at San Diego Comic-Con this year that the standalone Flash film would be titled Flashpoint, we now have three major adaptations of the series. Here’s a guide to what makes each one stand out. What it is: A direct-to-video movie set within Warner Bros.’ series of DC Animated films. 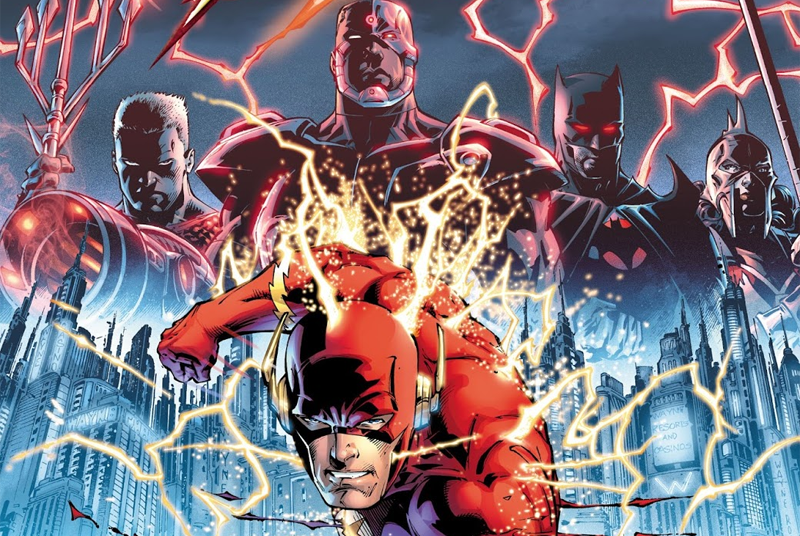 What it took from Flashpoint: All the major beats from the comics, right down to acting as the relaunch of a new, interconnected continuity for the animated films. What it Added: Eobard Thawne, referred to here as his other alter-ego, Professor Zoom, rather than Reverse-Flash, is kept much more nebulous when it comes to his involvement in the death of Barry’s mother. The movie also ends with a direct cliffhanger teasing the arrival of a parademon army on Earth, the set up for the next animated movie, Justice League: War, itself an adaptation of the first New 52 Justice League storyline. What it is: The third season of the CW’s take on the adventures of Barry Allen, Central City’s scarlet speedster. What it took from Flashpoint: The name and... the idea of an alternate timeline where Barry’s mom was alive? That’s pretty much it. What it Added: Barry Allen being both a selfish idiot and the villain. The Flash’s version of Flashpoint was not as far-reaching as the events of the comics, but it deeply impacted the lives of Barry’s closest friends and family, which lead to rifts forming between them when it was discovered Barry created the alternate timeline out of some ridiculously selfish reasons, making their lives—especially for his STAR Labs colleagues Caitlin and Cisco—miserable. It was a move that undid a lot of the character development Barry had gone through in the first two seasons of the show, and left a sour taste in the mouths of a lot of fans. What it is: The standalone Flash movie in DC’s extended universe of live-action movies, the first to feature Ezra Miller’s Barry Allen in the leading role after his appearences in Suicide Squad and Justice League. What it took from Flashpoint: We don’t know yet, beyond the name. What it added: Likewise, we only know the name! But this is going to be a hugely important movie for the DCEU if it has similar repercussions to the wider universe like Flashpoint did. Over the past few days we’ve seen Warner Bros’s plans for a line of alt-reality “Elseworlds” movies become clear, with an out-of-continuity Joker origin movie and even a Booster Gold film in the works, making for an increasingly confusing slate of future movies set in and out of the DC Extended Universe. If Warner Bros. really is gearing up for a bunch of standalone movies out of its continuity, then what better way to set that up by shattering the timeline in the Flash movie? And hey, with constant rumors about Ben Affleck’s future as the latest movie Dark Knight being in doubt, maybe the idea of presenting an alternate Batman in Flashpoint would lay the groundwork for a new actor to come into the fray, too. But we know so little about this movie at this point it’s hard to say what it could do for DC’s movies, even with the Flashpoint name.